The house caught fire around 7 am last sunday, fire fighters were called just to find the second floor of the family home fully engulfed with heavy smoke and flames. They were able to put out the fire and everybody was able to escape uninjured but the property was heavily damaged and lots of belongings were lost. It has been a shocking and terryfying experience to all of us. We’ve not only lost a family home but also a second home to all hope home kids and many volunteers, who have stayed in the house while volunteering at children’s hope home. The cause of the fire has not yet been determined but we are certain that it was not intentionally set and may have been the result of an electrical fault. Lucy said Ndegwa, their grandson, woke up to the strong smell of smoke and ran downstairs calling out for her. From Ndegwa realizing the smoke in the room to the house being totally involved in flames was just a matter of a few minutes, she said. By the time she reached upstairs to get Njeri, her younger granddaughter of three years, who was still sleeping, she could hardly see anything. The flames and smoke were everywhere. Somehow she managed to pull her out, which appears to be a miracle to all of us. So far Njeri and Ndegwa are physically fine though they seem to be very affected by the whole situation. Despite the pain of loosing the house and all the destroyed belongings, we are greatful that everybody made it out safely. For now the family is trying to figure out what to do next after the trauma of watching their family home of five years go up in flames and losing almost everything they own. 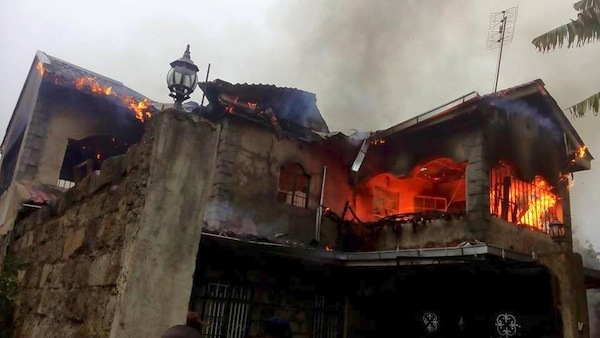 The house is complete blackened and broken and the rooms that have not been completely destroyed by flames have been severely damaged by the smoke and the extinguishing water. They will have to pick up the pieces and probably start from scratch since they are still waiting to find out if their home will be declared a total loss. As you can see on the picture above the damage upstairs is extensive but as for the main floor it appears to be intact, aside from broken windows and repairable damages that were caused during the firefighting. So we were hoping to be able to re-use it and only have to restore the upper part. Unfortunately at this point the whole structure of the house is considered unsafe and we might have to rebuild it from scratch. There are concerns that the heat from the fire might have damaged or weakened the primary structures and we are not sure whether it is adivisable to rebuild on the same foundation. This will be determined after inspection by structural expertise. But even in this situation Lucy and Duncan still consinder themselves and their family blessed and requested that nobody should cry over lost property. Lucy said she is grateful that everyone came out safe we could've been dead or grieving right now. Things can be replaced, people can’t. We will be travellig to see the family from the 9th of August. On the 18th of August 5 new weltwärts-volunteers will follow us. Life at hope continues and we are going to work this out. For the meanwhile the family has been staying with relatives. But they are looking to rent a house with enough space for volunteers as well. So you are all welcome to volunteer and then we’ll see that we help rebuild the house! For this purpose we are hoping for your support. We are reaching out to our hope home community and friends to try and raise any funds possible to help the familiy go through the process of recovery and rebuild their home. Please share this and spread the message. We know we can do some good for these people who deserve it so much. For donations please see the account details or paypal button below. Thank you again to everyone! We’re totally overwhelmed with the support many people are showing.